The Dunlop MSA British Touring Car Championship and TOCA have been working alongside the organisers of the Silverstone Classic (20-22 July) to mark further celebrations of the BTCC’s 60th anniversary with a special homage to the series’ iconic, historic racing saloon cars – adding to the championship’s Diamond Jubilee festivities, including the already-announced Diamond Double race set to take place at Snetterton on Sunday, 31 July. Tin Top Sunday – on Sunday, 22 July – will encompass a timetable of no fewer than four magical races for iconic cars from bygone eras. 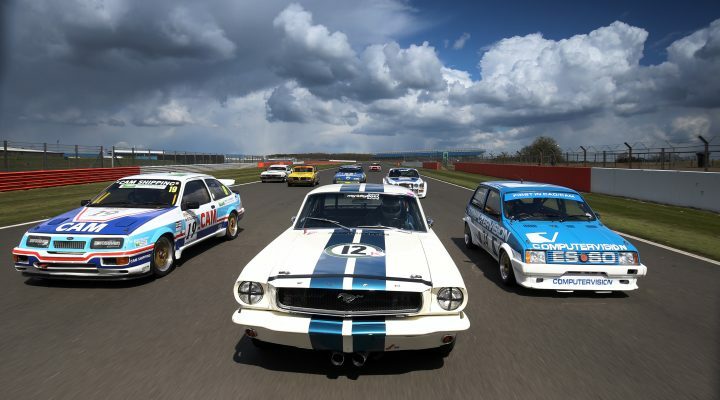 Close to 200 of the BTCC’s most illustrious machines will be reliving their glory years on the full Silverstone Grand Prix circuit, many raced by legends past and present. Ensuring the maximum spectrum of the championship’s 60-year history is showcased, the selected grids will put the spotlight on four very different generations. Turning the clock right back to the early sixties, the Under 2-litre Touring Cars (U2TC) grid is an ultra-competitive contest featuring Alfa Romeo GTAs, BMW TiSAs, Lotus Cortinas and giant-killing Mini Coopers. Highlighting its status, multiple BTCC champions Matt Neal and Gordon Shedden teamed up to win this rousing race in 2015. While the BTCC’s formative seasons were dominated by sporty versions of locally produced European saloons, by the mid-sixties, mighty American V8 muscle cars had come, seen and conquered. It is a thunderous epoch, perfectly represented by the return of the Trans-Atlantic Touring Car Trophy – fans can look forward to a massive 50+ car grid laden with Mustangs, Galaxies and Falcons. By the mid-seventies, the Yank Tanks had been outlawed and in their place, BTCC grids were filled with Capris, Rover Vitesses and smaller-hearted speedsters such as the Triumph Dolomite Sprint, Alfa Romeo GTV and BMW M3. These icons will be among those included in the exciting Historic Touring Car Challenge (HTCC). Adding to the retro drama, the U2TC, Trans-Atlantic and HTCC close encounters will all include a compulsory mid-race pit-stop and optional driver change. Completing the BTCC Diamond Jubilee celebrations will be double-header rounds of the JET Super Touring Car Trophy, putting the spotlight on the high-tech tourers from the nineties. A large number of past and present BTCC star drivers will be joining the party. Indeed, many notable touring car aces have become regular competitors at the Silverstone festival and fans can expect a bumper turn-out in 2018. Those revving up in recent years have included past champs Neal, Shedden, John Cleland, Tim Harvey and Colin Turkington as well as tin-top legends such as Jeff Allam, Gianfranco Brancatelli, Rob Huff, Jim Richards and Steve Soper. Full details are available on the silverstoneclassic.com website, and tickets for the BTCC’s Diamond Double special at Snetterton can be found here.